IT planning is the process of developing IT objectives and goals. Proper IT planning involves planning for and considering potential investments and goals in order to streamline the IT decision making process. In general, proper IT planning can make your IT process more thoroughly aligned with your business goals and more flexible to meet changing business needs. Additionally, planning ahead of time and being proactive instead of reactive can help save your company a great deal of money. You will be able to appropriately use resources and figure out simpler ways to deal with your current challenges. The IT planning process can be completed with your in house IT department or by working with a virtual CIO (Chief Information Officer) from a local IT company. At Forward Slash Technology, we offer IT planning and virtual CIO services for St. Louis area businesses and business across the country including small and medium sized companies. We are able to review your company situation and apply our expertise to helping you create an IT plan that meets your company goals, budget, and changing needs. To learn more about our IT planning services, please contact our IT company. 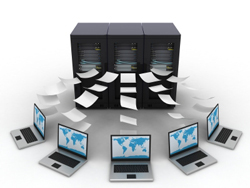 IT planning is the cornerstone of an IT capital planning and investment control process. In general, the IT planning process identifies a baseline for current IT performance and then sets goals for planned performance. The plan then considers and identifies functional requirements necessary to bridge the gap between the current and planned performance and determines alternatives for meeting these goals. The end result of the IT planning process is typically provides management with information on acquisition and life-cycle costs, schedules, and performance expectations for current and proposed capital assets. The main goal of the IT planning process should be to determine a budget for IT expenses each year. This allows you to prevent major issues and unexpected or unplanned expenses. During the IT planning process, we generally recommend replacing hardware based on a timeline that is in accordance with the expected lifecycle of the product. We also recommend keeping mission critical devices under the manufacturer warranty and planning to replace them as the warranty runs out. This helps prevent unexpected capital expenses for hardware replacement. For example, an Exchange Mail Server or SQL Database Server can cost $10,000 to replace, and businesses do not want that to come up as an unexpected expense. Using the services of a virtual CIO for IT planning can be a good choice for many small and midsized companies. In general, these smaller companies do not have the budget to employ a large IT staff and experienced CIO. Therefore, working with the virtual CIO services from an IT company will allow you to improve your IT planning process by benefiting from the knowledge and experience that the IT company brings at an affordable cost. Benefit from a team of IT professionals: At Forward Slash Technology, our IT planning services are performed not only by one professional, but by a team of IT professionals. This allows you to benefit from the experience and expertise of our entire team of experts, including those trained in multiple disciplines when completing your IT planning process. Receive Expert Advice: When working with our professionals for your IT planning, you can receive expert advice from experienced IT professionals that is tailored specifically to your business and your business's goals and needs. Lower your IT expenses: Proper IT planning allows you to take advantage of cost savings by only paying for the services you need. Additionally, IT planning can help you budget for expenses in order to prevent major unexpected expenses and to develop your IT department and network infrastructure into the system your business needs to excel and grow. Receive Ongoing IT Support: When you work with Forward Slash Technology for our virtual CIO and IT planning services, you not only receive support during the IT planning process, but you can also call our IT professionals as needed for additional support or advice. For example, if you experience unexpected problems or have an unforeseen need for new services, we can fix IT problems and recommend a solution to meet changing needs. To learn more about how IT planning and virtual CIO services can help your business develop and maintain an IT department that supports you in achieving main business goals, please contact our IT company today.